An engagement ring is one of the biggest purchases you’ll ever make in your life. Unlike other huge life purchases, an engagement ring also comes with a twist. There’s an added layer of emotion behind the purchase. The ring is symbol of your love and commitment. It’s a special gift you’re buying just for her. And it’s something she’ll wear forever. When love comes into play, you naturally want to get her the best. But the reality is that you don’t have an unlimited bank account. So the main goal is to get the most beautiful engagement ring within your budget – whether that’s $1,000 or $10,000. This is the hard part for almost all engagement ring shoppers. We are here to give you some guidelines for ring purchases at every price point. Your budget. Yes it’s important that she loves the ring. But it’s also important that your wallet loves it too. Simply put, you should only buy what you can reasonably afford. Remember, this is the first major purchase of your new lives together, and you don’t want to start it off by being in debt. Her personal taste. She’s going to wear this ring for the rest of her life. So it should be something that matches her style. Think about: what kind of clothes does she usually wear? Does she like to stick to tradition? Or does she like to make a statement? Does she even want a diamond? Shape. Not all women want a round solitaire. If she wants something just on the edge of tradition, she may like cushion or oval. If she has vintage tastes, consider emerald or asscher. And if she loves being the center of attention, pear or marquise will definitely stand out. And a plus – fancy shaped diamonds can be 20-40% cheaper than round. Read More: Which Shape is Best for your Engagement Ring? Setting. This is the style of the band. First, decide on the metal color. Does she want a gold or silver tone? Or maybe a romantic rose gold? Does she want something simple and understated or more flashy? You can also use settings to your advantage. 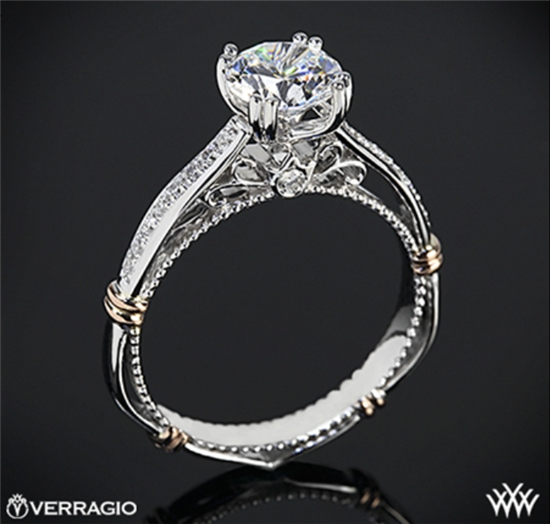 For example, a halo adds extra bling and will make the center diamond appear larger. Tip: If your girl doesn’t normally wear jewelry, you may have to ask her what style she likes. The downside to this is that a surprise proposal may be out of the question. But over 40% of brides like being involved in the shopping process so they get exactly what they want. Another thing to think of is whether the ring will match her fingers/hand. If she's got the perfect long slender fingers, then your job is easy... almost anything will look nice. So what about those with other hand types? If she's got chubbier fingers, a bold statement ring will suit her well. A thicker band will minimize the appearance of wider fingers. A larger center design such as halos and angular shapes will also look more flattering. If she has the opposite (small hands and fingers), then simpler rings with thin bands won't overpower them. 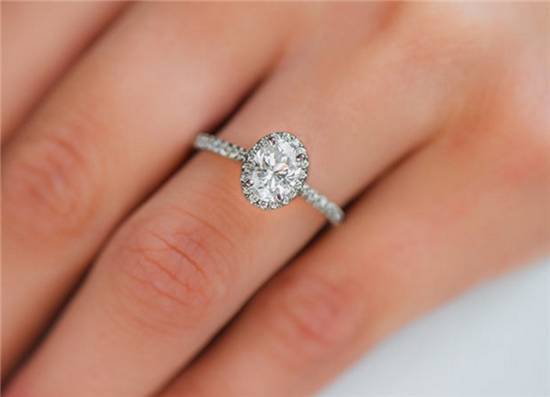 Elongated diamonds, like the oval or marquise, will help short thin fingers appear longer. Also, diamonds with smaller carat weights will look better proportionally. Her Lifestyle. This actually has a huge impact. If your girl is very active, a high-set ring that’s always getting caught on stuff will become super annoying. If she works with children, a ring with sharp corners won’t be ideal. If she has a high-power career, it may be more important to wear something flashier. Think about her work and hobbies and what kind of ring will best suit that. Tip: You'll have to take special consideration if you girl is a nurse or doctor. Because of the nature of their job, some hospitals may not even allow rings at work. If she is able to wear one, it's important that the ring won't get caught on stuff or scratch others. A bezel setting is best, as it has a smooth rim of metal around the diamond for protection. Also look for a low setting, or even flush with the band. Tension settings are also great choices for nurses or those who work with children. The 4C’s. 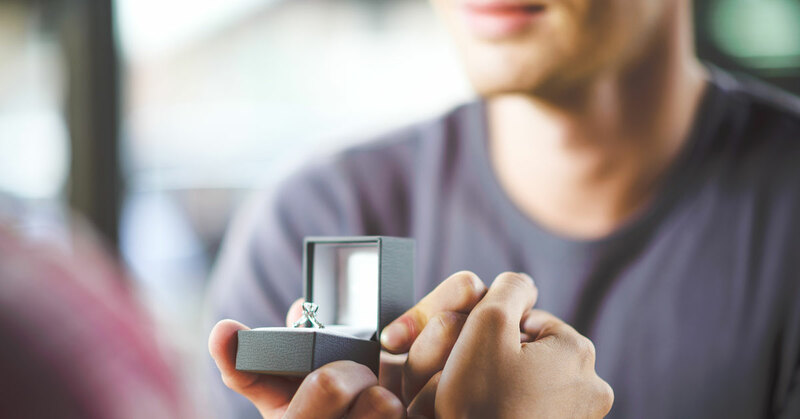 After you have an idea of what kind of ring she’ll like, it’s time to pick the actual diamond. Take your time to learn about the 4C’s (this is a great place to start). The trick is to find a balance of the 4C’s so that the diamond appears brilliant, colorless, and flawless. Carat. Most people prioritize the size of the diamond. After all, this is the thing that admirers see first. A lot of people also equate carat weight with love and affection. We do agree that carat is important, but it shouldn’t be your top priority. Cut. Instead, focus on getting the best cut possible. Cut (proportion, symmetry, and polish) is the single most important factor that determines how sparkly a diamond is. A well-cut diamond can be so sparkly that it hides flaws and masks color. Color. Most white (colorless) diamonds will have a yellow tint. Completely colorless stones are super rare and thus priced at a premium. Do you enjoy an icy white look to your jewelry or prefer warmer hues? Remember, the normal eye will not be able to detect slight hints of yellow. Clarity. This is the least important factor to consider because most flaws are too small to be seen with the naked eye. All you need is to find a diamond that is eye-clean. This is also why cut is so important, because a sparkly diamond can hide many flaws. SI2 Clarity: Good Enough for Engagement Rings? Now that you understand the factors to consider, you may find that it’s hard to put them into practice. If money’s no issue, then that’s great! You literally have every single option open for you. But for those of us with a fixed budget, how exactly do you find the most beautiful engagement ring on that budget? You can choose to put most of your budget towards the diamond and get as large of a stone as possible. In this case, a classic setting like a solitaire won’t cost too much. Simple solitaires go for as little as $200 - $600. This leaves the rest of your budget on the stone itself. Or you may want to get a smaller sized diamond and spend more on a fancier setting. Especially if you know that your girl will prefer something more flashy. In this case, the setting will make the statement. This is a great way to get a ring with more bling. A halo setting is glamorous and will give the appearance of a huge center diamond. A simpler halo runs around $700-$1,200. This is one of the best options if you want an impressive looking ring on a smaller budget. A pavé setting makes the center stone pop with a band of small diamonds. The average setting price also goes for around $700-$1,200. Vintage settings lend an old-world charm with elaborate carvings, scrolls, and bold designs. They’re great for the girl with unique tastes. Vintage settings typically go between $500-$2,000. Tip: When working with any budget (particularly smaller ones), we highly recommend that you shop for the ring online. Online retailers don’t have as high overhead, so they can keep the prices down (as much as 50% less than retailers such as Kay’s). And another HUGE plus is that you’ll get a lot more selection. So you have more to choose from at your price point. See our favorite online diamond retailers. Now let’s take a look at how you can put this into practice. To help you out, we’ve put together some suggestions at different price points. At this small budget, your choices are going to be rather limited. But it is possible! If you are looking for a real diamond, you’re going to be looking in the 0.4-0.5 carat range, with lower grades in color and clarity. This is okay because the smaller the diamond, the less you’ll be able to see tints or flaws. Just make sure the cut is ideal so that the diamond has fierce sparkle. Setting wise, it’s best to go with a simple solitaire (as low as $200) to put all the attention on the diamond. A 14k white gold or yellow gold will be the cheapest. Don’t worry, this is sturdy enough for everyday wear. Tip: When you’re dealing with a lower color grade (such as I or J), a good trick is to look for a diamond with a medium-strong fluorescence. Fluorescence is a blue glow that the diamond emits when under UV light. This blue tint balances out the yellow tint and can improve the diamond’s color. If you’re open to something non-diamond, then you have a lot more options. Not only do other gemstones make a huge statement, they’re a lot more wallet-friendly. Here are some options for beautiful engagement rings with other stones. As you can see, you can get a much larger gemstone on the same budget. Or you can even get an entire beautiful gemstone ring in a nice setting, such as this asscher cut blue sapphire and diamond halo ring. 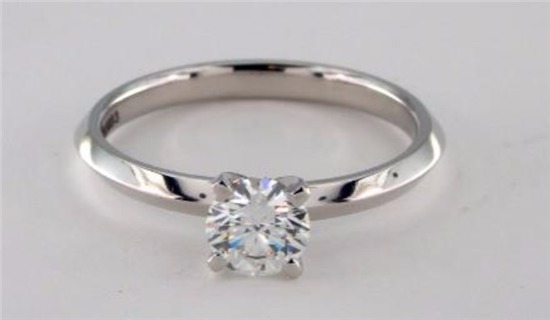 Shop for diamonds at Blue Nile, a CreditDonkey recommended partner for the largest selection of diamonds. At this price point, you can choose a slightly larger diamond (with upgrades in color and clarity). Or you can go for a fancier setting. But notice: you are only getting 0.1 carat more, which is hardly significant. By choosing a slightly smaller center diamond and a halo setting, it’ll make a much larger impact. At this price point, you can hit the coveted 1-carat mark if that’s your biggest priority. You just need to be smart about it by balancing the other 3C’s. If your goal is to maximize carat weight, it’s best that you still stick with a simple solitaire setting, so you use as much budget as possible towards the stone itself. If you’ve got your eye on a nicer setting, the good news is that you have a huge array of options with this budget. You can even select from some designer settings! You can choose to spend more on a nice setting and still have plenty left for a sizeable diamond. A fancier setting may make more of an impact, but it really all depends on her personal taste. Some like the classic understated glamour of a solitaire, while others like something more elaborate. 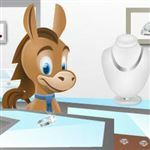 Shop for diamonds at Whiteflash, a CreditDonkey recommended partner for super ideal cut diamonds. You’re in a good position to buy a ring that looks like it cost more. An elegant setting like this pavé will bring a little bit more pizazz to the ring. And you’ll still have enough left for a modest 0.5 carat round diamond (with color I and clarity SI2). If you have the means and want to get her something amazing, go for it! You have a ton of options at this point, including all sorts of designer settings. You can then set it with an ideal cut 1-carat diamond (we recommend color H and clarity of VS2). If you want to put the bulk of this budget on the rock itself, you may be surprised that it doesn’t get you too much more. $10k will fetch a 1.3 carat diamond (with other characteristics the same). We also understand that some people are working with a very tiny budget. And this doesn’t mean that you need to skip out on the love and romance. For this price point, alternative stones is your best bet. Moissanite and cubic zirconia both behave similar to diamonds. Or consider other gemstones like morganite, sapphire, and topaz. Or if your girl is artsy, she may even love the look of a raw diamond ring. Buying the perfect engagement ring is a delicate balance of your budget, her style, and diamond quality. To sum it up, we always recommend that you put your money towards an ideal cut. And then pick the largest diamond you can get with the best cut possible. For truly small budgets, a simple solitaire setting will save you money so you can focus on the center diamond itself. Or consider other gemstone options so you’re not limiting yourself. If your budget is a tad bigger, a halo setting will do wonders in making a small center diamond appear larger. Fancy shapes are also great to gain some size, not to mention that they’re more unique. 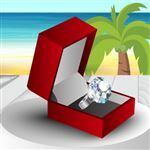 Share on Facebook "Best Affordable Engagement Rings for Every Budget"